As you probably know, the “LI” in “RHRLI” stands for Long Island. We love having our practice in this beautiful area and we’re proud to be the only hair loss treatment center on Long Island that offers a permanent solution to hair loss or thinning hair. It’s called the ARTAS® System and it uses cutting edge robotic technology to give you a healthy head of hair. When most people think of Long Island they tend to think of Nassau and Suffolk Counties, but we want to remind you that New York City’s boroughs of Brooklyn and Queens are also part of Long Island and RHRLI is convenient to residents all across Long Island, not just the two eastern counties. It’s worth the short trip from Brooklyn or Queens to RHRLI to learn more about the ARTAS® procedure. It’s a minimally invasive hair transplant that is FDA cleared and it can change your life. Your board-certified surgeon, Dr. Baiju Gohil, will use a robotic arm to search for healthy donor hairs and transfer them to where they’re needed. The precision of the ARTAS® system will give you the most natural head of hair you can find. It’s also a minimally invasive procedure and unlike older procedures such as strip surgery, ARTAS® won’t require stitches. It’s virtually pain free and you can expect a shorter recovery time. Most patients can begin to resume normal activities in a day or two. It seems like everything about Brooklyn is cutting edge these days. So why not try the most advanced hair loss solution out there? Whether you live in Brooklyn Heights, Park Slope, Williamsburg, Bay Ridge, or Bensonhurst, RHRLI’s cutting edge technology is only about 30 to 40 minutes away. Just take the Jackie Robinson Parkway to the Grand Central Parkway and continue east on the Northern State Parkway. Take exit 35S for New York 107 S toward Hicksville and merge onto N Broadway. We’re at 366 N. Broadway. Dr. Gohil will consult with you and examine you. He’ll take you through all the steps of the procedure and he’ll also be happy to answer any questions you may have. 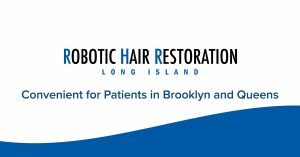 If you’re from Queens and you’re looking for a permanent solution to hair loss, RHRLI is very convenient to where you are. You can take I-495, the Long Island Expressway to exit 41S toward NY-106 S/NY 107 S toward Hicksville. Merge onto S Marginal Rd, and use the right 2 lanes to turn right onto N Broadway. Whether you’re from Bayside, or Bellerose, Flushing or Forest Hills, you can feel more confident about how you look after undergoing the ARTAS® procedure. After your procedure, new hair will begin to grow in about three months and you’ll have a permanent solution. If you live in Brooklyn or Queens, you don’t have to travel far to find a solution to your hair loss. RHRLI is proud to serve these unique and diverse boroughs. Whether you live in College Point or Crown Heights, we’re only minutes away. To learn more about the ARTAS® System or to schedule a consultation, contact us today.